Hyperthermia (HT) is a method used to treat tumors by increasing the temperature of the cells. The treatment can be applied in combination with other verified cancer treatments using several different procedures. We sought to present an overview of the different HT tumor treatment, recent advances in the field, and combinational treatment sequences and outcomes. We used a computer-aided search to identify articles that contained the keywords hyperthermia, cancer treatment, chemotherapy, radiotherapy, nanoparticle, and cisplatin. There are three types of HT treatment, which each need the use of applicators that are in contact with or in the proximity of the patient for the purpose of heating. Heating can be achieved using different types of energy (including microwaves, radio waves, and ultrasound). However, the source of energy will depend on the cancer type and location. The temperature used will also vary. HT is rarely used alone, and can be combined with other cancer treatments. When used in combination with other treatments, improved survival rates have been observed. However, despite in vitro and in vivo studies that support the use of concurrent hypothermia treatments, contradictory results suggest there is a need for more studies to identify other hidden effects of HT. Objectives: Obesity is a common disorder that has a significant impact on morbidity and mortality. Twin and adoption studies support the genetic influence on variation of obesity, and the estimates of the heritability of body mass index (BMI) is significantly high (30 to 70%). Variants in the fat mass and obesity-associated (FTO) gene have been associated with obesity and obesity-related phenotypes in different populations. The aim of this study was to examine the association of FTO rs9939609 with obesity and related phenotypes in North Indian subjects. Methods: Gene variants were investigated for association with obesity in 309 obese and 333 non-obese patients. Genotyping of the FTO rs9939609 single nucleotide polymorphism (SNP) was analyzed using Restriction Fragment Length Polymorphism Analysis of PCR-Amplified Fragments. We also measured participants fasting glucose and insulin levels, lipid profile, percentage body fat, fat mass and fat free mass. Results: Waist to hip ratio, systolic blood pressure, diastolic blood pressure, percentage body fat, fat mass, insulin concentration, and homeostasis model assessment index (HOMA-Index) showed a significant difference between the study groups. Significant associations were found for FTO rs9939609 SNP with obesity and obesity-related phenotypes. The significant associations were observed between the rs9939609 SNP and blood pressure, fat mass, insulin, and HOMA-index under a different model. 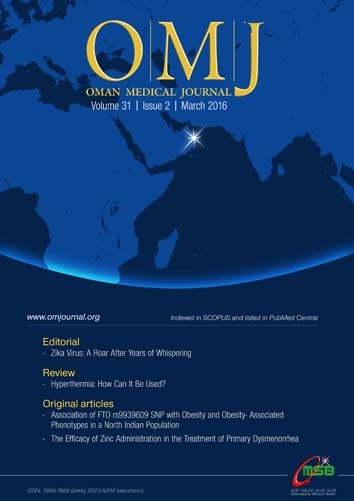 Conclusion: This study presents significant association between FTO rs9939609 and obesity defined by BMI and also established the strong association with several measures of obesity in North Indian population. Objectives: Dysmenorrhea is a common complaint in women. Primary dysmenorrhea is defined as painful menstruation in the absence of pelvic disease and is caused by uterine contractions caused by prostaglandins released from the endometrium. Conventional treatments include nonsteroidal anti-inflammatory drugs and oral contraceptives. We sought to evaluate the efficacy of zinc supplementation in the treatment of primary dysmenorrhea. Methods: Two-hundred participants with primary dysmenorrhea were randomized into one of two groups. The intervention group received zinc and mefenamic acid, and the control group received mefenamic acid and a placebo drug. After three months of treatment, changes in the incidence of dysmenorrhea and the degree of pain were measured in both groups. Results: The mean pain score before administration of zinc and mefenamic acid in the intervention group was 5.3±1.8 and after treatment was 1.2±1.9 (p < 0.001). In the control group, the mean pain score before administration of mefenamic acid and placebo was 5.8±2.1 and after treatment was 2.9±2.6 (p < 0.001). The difference in pain levels before and after treatment in the intervention group was 4.1±2.8, and in the control group was 2.9±1.7 (p > 0.050). We also found that 64% of case group and 33% of the control group did not experience dysmenorrhea after treatment (p < 0.001). Conclusions: The use of a zinc supplement in combination with mefenamic acid was superior in reducing primary dysmenorrhea compared to mefenamic acid alone. Objectives: The role of injury-related variables in determining health-related quality of life (HRQOL) among Iranian persons with spinal cord injury (SCI) has not yet been fully described. In this study, we compared HRQOL between individuals with injury at cervical level and those with injury at thoracolumbar sections and evaluated the discriminating value of injury level as a determinant of HRQOL among Iranian people with SCI. Methods: Individuals with SCI, who were referred to Brain and Spinal Cord Injury Research Center, were invited to participate in this investigation. HRQOL was assessed using the Short Form (SF-36) questionnaire to determine the quality of life (QOL) in eight domains: physical functioning (PF), role limitation due to physical problems (RP), bodily pain (BP), general health (GH), vitality (VT), social functioning (SF), role limitation due to emotional problems (RE), and mental health (MH). Results: Ninety patients with paraplegia and 94 quadriplegic patients participated in this investigation. The mean score of PF domain was significantly lower in patients with injury at cervical level (p < 0.0001). There was no significant difference in other domains of SF-36 between subjects with paraplegia and quadriplegia (p = 0.670, 0.700, 0.910, 0.710, 0.730, 0.290 and 0.850 for RP, RE, VT, MH, SF, BP and GH, respectively). Similarly, the mean physical component summary (PCS) score was significantly higher among individuals with injury at thoracolumbar sections (p < 0.0001). The mean mental component summary (MCS) score did not differ between the two groups (p = 0.720). Conclusions: Patients with SCI at the cervical level have similar mental health compared to those with injury at thoracolumbar sections, which shows proper mental adaptability in quadriplegic individuals. Injury level can be used as a major determinant of the physical component of QOL among people with SCI. Objectives: To estimate the prevalence of rheumatic diseases in the Emiratis attending primary health care (PHC) clinics in Dubai. The secondary objective was to study the relationship between age, gender, and body mass index (BMI) and rheumatic diseases in the general population. Methods: The Prevalence of Rheumatic Diseases and Osteoporosis (PRO) in Dubai study was a cross-sectional study, which randomly enrolled Emiratis’ aged between 18–85 years old who attended one of 13 PHC clinics between 2 January 2009 and 31 December 2009. Demographic and health data for all participants was obtained via a questionnaire. Participants that indicated positive answers had their responses validated by a rheumatologist and underwent a thorough locomotor examination. Results: The study included 3,985 participants with a mean age of 42.1±15.8 years. The majority (77.4%) were female. Lower back pain was the most prevalent problem in our study population (32.9%). Knee osteoarthritis (OA) was the most common form of arthritis seen in our cohort (25.8%). Overall, the prevalence of inflammatory arthritis was 3.1%. Age and BMI were associated with increased risk of knee OA and lower back pain. Conclusions: Rheumatic diseases are quite common in Emirati patients attending PHC clinics. Lower back pain and knee OA were the most common musculoskeletal diseases seen in our cohort. There is a need for more population-based studies in the Middle East to have a better understanding of the epidemiology of rheumatic diseases in this region. Objectives:Fragmented blood transfusion services along with an unmotivated blood donation culture often leads to blood shortage. Donor retention is crucial to meet the increasing blood demand, and adverse donor reactions have a negative impact on donor return. The aim of this study was to estimate adverse donor reactions and identify any demographic association. Methods: We conducted a prospective study between January 2011 and December 2013. A total of 41,759 healthy donors were enrolled. Professionally trained donor attendants drew blood and all donors were observed during and following donation for possible adverse events for 20 minutes. Blood donors were asked to report if they suffered from any delayed adverse consequences. Results: Out of 41,759 blood donors, 537 (1.3%) experienced adverse reactions. The incidence was one in every 78 donations. The mean age of donors who experienced adverse events was 26.0±6.8 years, and all were male. Out of 537 donors, 429 (80%) developed vasovagal reaction (VVR), 133 (25%) had nausea, 63 (12%) fainted, 35 (6%) developed hyperventilation, 9 (2%) had delayed syncope, and 9 (2%) developed hematoma. Arterial prick, nerve injury, cardiac arrest, and seizures were not observed. Donors aged less than < 30 years and weighing < 70 kg were significantly associated with VVR, hyperventilation, and nausea (p < 0.005). Undergraduates and Urdu speaking donors also had a significant association with fainting and nausea, respectively (p < 0.05). Conclusion: The prevalence of adverse events was low at our tertiary center. A VVR was the predominant adverse reaction and was associated with age and weight. Our study highlights the importance of these parameters in the donation process. A well-trained and experienced phlebotomist and pre-evaluation counseling of blood donors could further minimize the adverse reactions. The introduction of measles vaccination programs and broad coverage worldwide has meant this infection a rare encounter for pediatricians. In Oman, with almost 100% measles vaccination coverage for children, this infection disappeared from the list of fever and rash differential diagnoses. Encephalitis is a well-known complication of measles infection and sometimes can be the only manifestation especially in adults. We report a seven-year-old Syrian immigrant who was admitted to the Royal Hospital, Muscat, with acute encephalitis secondary to wild measles infection. Although she had a classical presentation of measle infection, the diagnosis was missed in the private and regional hospital she attended before getting referred to Royal Hospital. She was later identified to be exposed to an outbreak of the infection in an unvaccinated population. Magnetic resonance imaging showed high signal intensity of both basal ganglia suggestive of measles encephalitis. The diagnosis was confirmed by detection of measles virus from her urine and blood, and a throat swab. The isolated measles virus was D8 serotype, which was prevalent in Syria around the same time. The child was treated with steroids and vitamin A. She achieved full recovery despite her severe presentation. A high degree of suspicion for measles infection should be maintained in unvaccinated children with a compatible presentation of the infection or its complications. There might be a role for steroid use in cases of acute measles encephalitis.